Designer DJ Booth — DJ CORY BARRON & CO.
Our Designer DJ Booth collection was created as a more aesthetically pleasing way to conceal our equipment in an effort to positively impact your professional pictures & video. We're constantly adding to our inventory based on design trends & customer requests. Don't see one you like? Ask for a custom design. 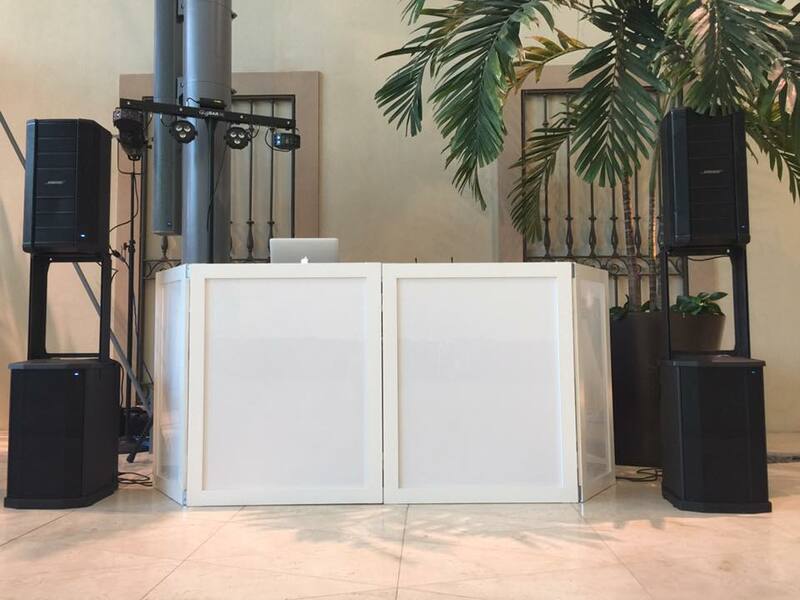 Our DJ booths are available for rent based on availability. Our most sought after DJ Booth, custom designed and hand crafted in Miami, FL. The simple & elegant design matches most decor and pairs well with commonly rented white leather lounge furniture from local rental providers like: FH Weddings, AFR, So Staged, Style House, MMD, Elite Event Rentals, & More. The white frame over commercial grade white plexiglass glows almost any color and is great for any lively party. This is our second most rented booth, also custom designed and built in Miami, FL. The plexiglass allows us to add decals for quick company banding or monograms for events ranging from weddings to Mitzvahs. The Museum of Fine Arts (St. Petersburg, FL), Hyatt Regency (Clearwater Beach, FL), Hilton (Clearwater Beach, FL) The Don CeSar (St. Pete Beach, FL) and countless others. Our first design incorporates various orange & red tones wrapped in a lighter natural wood frame. Our second build in this series, boasts a beautifully textured white wash brick wrapped by a dark stained wood frame.